If you haven’t noticed by my site and twitter logos, I love the classic two bar mask. To me, the two bar mask is quintessential football. Anything that includes the two bar mask is pure art to me. When I first started watching football in the mid-eighties, the Two-bar was already on its way out. Players like Steve Largent were switching to more modern masks and by the 90s the only non-kicker who still wore one was Mark Super Duper. He more than likely was the last NFL player to ever wear one. Even with the on field appearance of the two bar mask becoming rare, the NFL graphics and merchandise still featured the classic helmet look into the 90s. A midfield two bar helmet is to me, the greatest thing ever. Painting a two-bar helmet on the field, as is only natural. 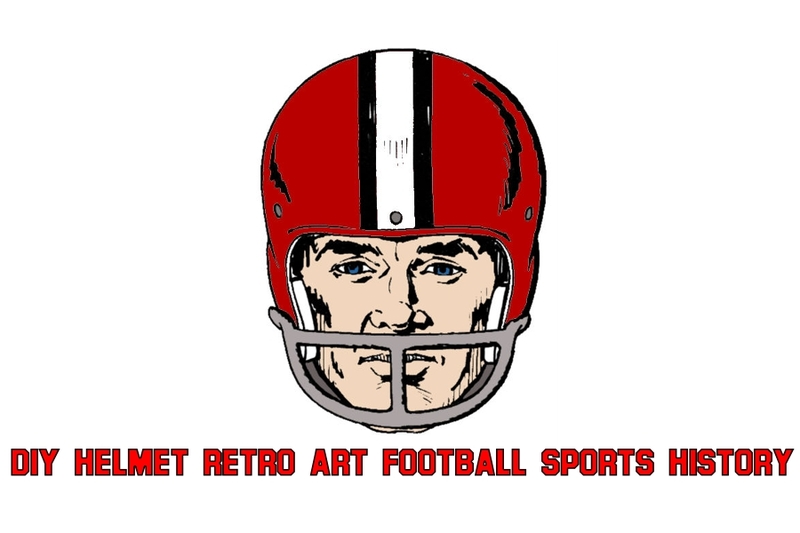 Eventually as teams replaced their turf and and the NFL transitioned to other more “modern” helmet graphics, the two-bar era of football came to an end. Occasionally teams will use the old graphics as part of their throwback presentation and it is as amazing as you would think. 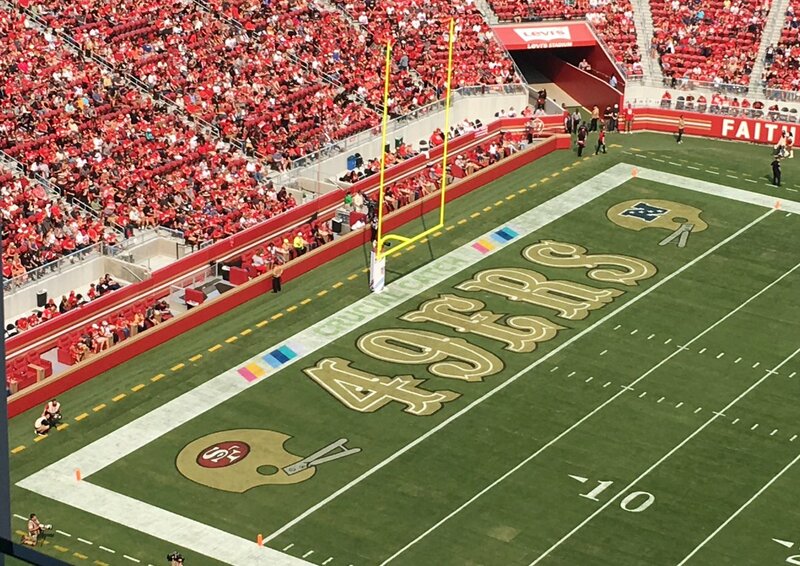 The Buccaneers brought it back out when they last wore the Bucco Bruce uniforms and the 49ers included the ol’ two-bar in their end zones last season. It should be a law that if you wear throwbacks, the field should be dressed in throwbacks, although field turf makes this a little tougher to do, I guess. Earlier this week the NFL preseason schedule was announced and all of the teams rolled out graphics to post the schedule. One team got it right. The Chiefs post featured some classic two-bar helmets and it was glorious. They even included gray masks! That franchise is one that knows what they are doing when it comes to a classic look. and many, many more. Who did I miss, who is your favorite? With the start of the hockey playoffs (not for my Sabres Sadly, again) I thought I would take a look back to one of my first sports DIY project. My homemade Buffalo Memorial Auditorium Scoreboard. Aud Seating Chart From The Phonebook. When I was a kid, I went to a few NHL games a year and every time I got to go was a real treat. My uncle would often get tickets to Sabres game through his work and we would have sweet seats a few rows form the ice. I just remember how exciting it was to drive the 10 miles or so to the city and walk into what seemed to a kid of 8 or 9 an ancient building. I can remember the smell of the old barn and walking through the endless corridors to our seats where we would stop for a souvenir puck or mini hockey stick. If we didn’t get tickets down low, we would by the family packs where we would sit high in the rafters in the orange section. where the seats were so steep it would make you dizzy. Sadly, in 1995 they began construction on a new Arena down the street and in 1996 “The Aud” would sing its swan song. The final professional team sporting event held at the old Aud was a MILL indoor box lacrosse Championship where the Buffalo Bandits defeated the Philadelphia Wings for the league championship. I got in to that even for 12 bucks and got to say goodbye to the arena that was an important part of my childhood. In the fall of 1996 the Sabres and all the events that used to take place in the Aud moved to the new arena while the Aud would sit vacant and deteriorating for another decade before finally being demolished. In the years between, the CBC did a piece in the dark Auditorium for the original Winter Classic pregame and many Urban explorers made their way through the facility before demolition began. I would have loved to take one last stroll around the old place, but I found out too late and never had another chance to step inside. I had the idea to make a scoreboard when I had my Air Hockey table out. At first I dreamed of having a working electronic replica, but that turned out to not be feasible, so I went with the cardboard variety. I took blue presentation board that matched the original color of the scoreboard and cut it into the shape of the scoreboard. For the old style bulb displays I used different size and color rubies that I bought at the craft store. Finally I glued it all together and added some ads, which were part of the real scorebord in the last part of its existence. When I first made it, it was also featured on Uni-Watch. Sadly no one thought to save the real scoreboard, so my replica is basically the closest to having the real thing around. One of my first attempts to have a replica or player inspired helmet,was this Thurman Thomas helmet.